At 5 Star Car Title Loans, we know how exciting it can be to celebrate Easter with your friends and family. Everyone likes to enjoy Easter baskets with colorfully decorated eggs and little gifts. There are also Easter parades and Easter egg hunts to join. This spring why not invest in new Easter decorations and expand your family get togethers? Don’t miss out just because you don’t have enough money. Apply for a car title loan so we might be able to help you with some quick cash. 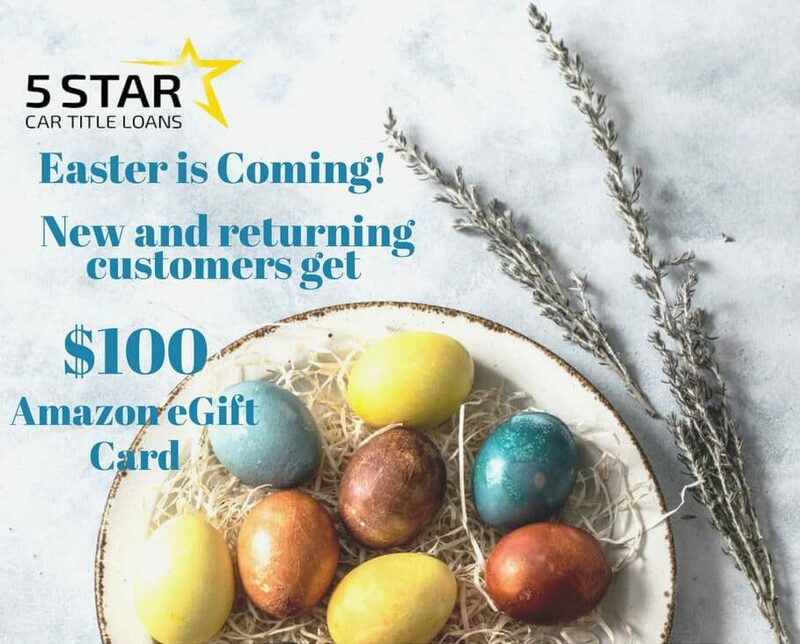 This Easter, your money will go even further – As a new or returning customer, we will send you a $100 gift card to spend at Amazon* however you choose. Call us today and let’s work together to make this holiday a great one! disclaimer: Terms & Conditions: Offer expires on 04/22/19 at 11:59 PM. You must present this message, in print or webpage form, during your loan appointment. Loan approval is not guaranteed and subject to meeting our credit criteria, which includes provision of acceptable property as collateral. You must demonstrate ability to repay the loan. Coupon can be redeemed only once and is non-transferable. You cannot redeem multiple offers. 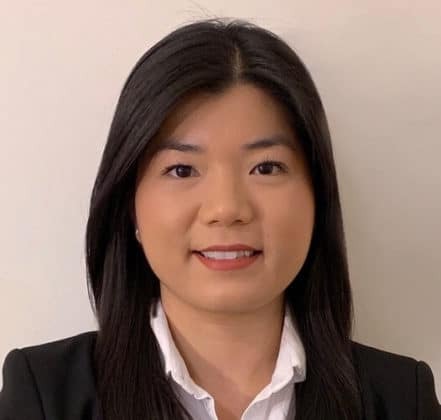 Loans made or arranged pursuant to a California Financing Law License #603J988 5 Star Car Title Loans (5 Star Loans, Inc., DBA). 5 Star Car Title Loans may act as the broker for the loan, and may not be the direct lender. The APR for a typical $2600 loan is 120.656% with 36 payments of $270. Offer is available for new and returning prospects only. *$100 Amazon eGift Card: Only qualified applicants who receive a loan at a minimum amount of $2600 can redeem the offer. A $100 E-gift card will be sent to the email address provided by the qualified applicants at the time the loan is funded. 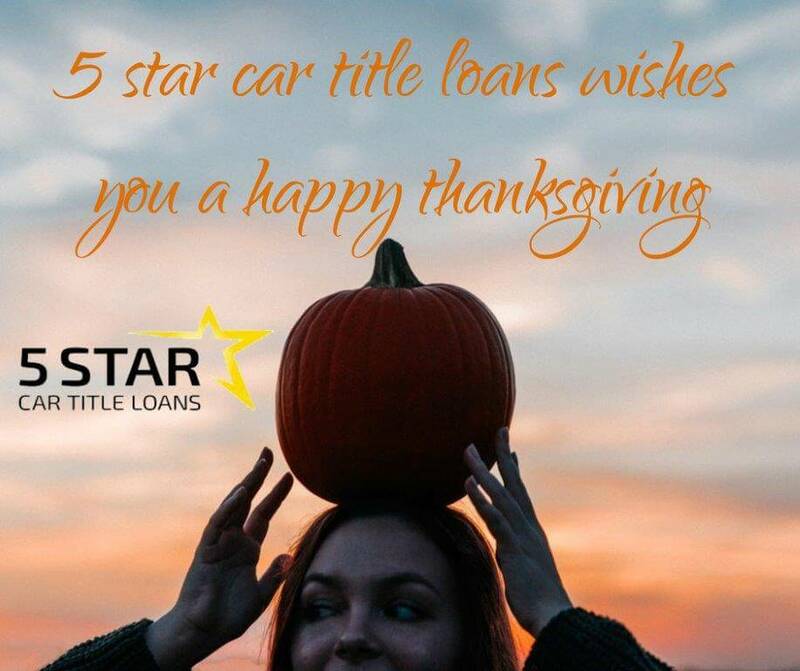 5 Star Car Title Loans wants your loan experience to be pleasant from beginning to end. In order to assist you, we’ve collected our most frequently asked questions. Don’t see the answer?